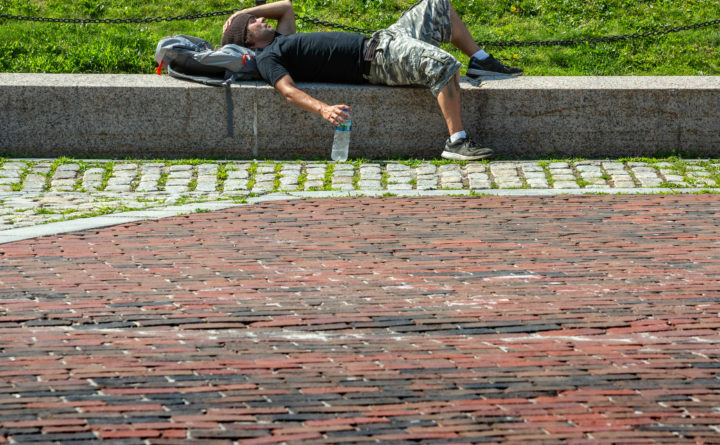 Jason Michaud stays hydrated while sunning himself in Portland's Monument Square. Forecasters say August was the hottest on record for Portland. Records date back to the 1940s. If you felt Portland was a little steamy last month — you were right. The average temperature, including daytime and nighttime, was 4 degrees above average at 72.2. The city’s average high temperature was 80.8 degrees, compared with a historical average of 77.7 degrees. The average low temperature was 63.5 degrees, compared with the historical average of 58.2 degrees. “That is the warmest August ever recorded at Portland,” said meteorologist Margaret Curtis, with the National Weather Service in Gray. The records go back to 1940, Curtis said, and compounding the heat was also a record amount of humidity. “This summer we actually had a record setting amount of days with dew points over 70,” Curtis said. Curtis said that meant things felt worse than normal with warm, sweaty nights, as well as muggy days. She also said that while “climate” is not determined by one or two warm summers, the records are adding up. “I will say that our second warmest August was in 2016, so we are seeing more of these warmer temperatures more recently than in the past,” Curtis said.